"You take what's real. Stir in imagination and then a character is born." Alyssa Satin Capucilli described to Celebrity Parents Magazine that her beloved character, Biscuit, was created the day after her four year old daughter decided to babysit a neighbor's dog. (Click here to view a YouTube video describing her "Stir in Imagination" idea with a group of students.) "What I was most struck by was how she was having a conversation with him. She thought he understood her." (Woof, Woof!) The series of Biscuit books is celebrating its 15th year with the release of the upcoming title, Biscuit and the Lost Teddy Bear on January 25, 2011. This will the 15th book in the series of My First I Can Read Books. Additionally, there are many holiday, board books, and interactive books (Lift the flaps, scratch and sniff) about Biscuit including Happy Thanksgiving, Biscuit! and Biscuit's Christmas . Where did the name "Biscuit" come from? Capucilli said, during an interview with Hastings on Hudson, the name "just popped into her head". However, Hello, Biscuit adds another dose of Capucilli's imagination by telling the story of how the name was given after the puppy's persistence with a box of biscuits. Capucilli has written many other books besides the Biscuit series. She began "telling stories through movement and dance, and spent numerous years dancing professionally." (alyssacapucilli.com). She used her dancing experience and her gift of writing to create the Katy Duck Series about a "feisty ballerina in the making". 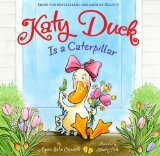 This week we read Katy Duck is a Caterpillar. In this story, Katy is assigned the role of a caterpillar for a dance performance which makes her unhappy, but she makes the most of the situation and steals the show! On Alyssa Satin Capacilli's website I found a Reader's Theatre for Mrs. McTats and Her Houseful of Cats , one of her favorite books she has written. We printed out the script provided by the website, highlighted the text for each part, and gathered props. I printed out 25 cat pictures from a Google Image Search. We glued cat pictures on card stock and folded the paper so the cats could sit next to Mrs. McTats, played by my daughter. She wore glasses and a shawl while my son wore cat ears, a tail, and painted-on whiskers. He was in charge of bringing in all the cats that Mrs. McTats welcomed into her home. We set up a market (our puppet theatre) with food (pretend meat and fish that Mrs. McTats would buy for the cats). Our dress rehearsal ended up being better than the show, but it was a lot of fun. Thanks to Grandma for playing the part of the "Counter" of all the cats! A Call for Comments: Alyssa Satin Capucilli is always happy to hear someone tell her that a Biscuit book was the first book they read all by themselves. What was the first book you read by yourself or which book did your kids first read by themselves? I spotted Alyssa Satin Capucilli's Inside a House That Is Haunted (illustrated by Tedd Arnold) being read at my son's preschool for their Halloween Party. She also wrote the rebus read-long stories, Inside a Barn in the Country and Inside a Zoo in the City . Fantastic post as usual. The first book I can really remember reading was Peter Rabbit by Beatrix Potter. My mom had an "children's version" and I couldn't seem to put it down. She still has it and I'm hoping to pick it up soon to share it with my own children. This is one of our very favorite beginning reader series. My daughter loves to read all the Biscuit books to her brother. Thanks for adding your post to the I Can Read Carnival.